In the past, I compiled such observations on Fridays. But I was inspired by Nicole's recent five senses, so I'm attuned to my own this overcast Thursday. -So many Monarch butterflies in our neighborhood; Johnny thinks they're migrating. Grace is flitting around everywhere. I'm finding that I love the color orange. 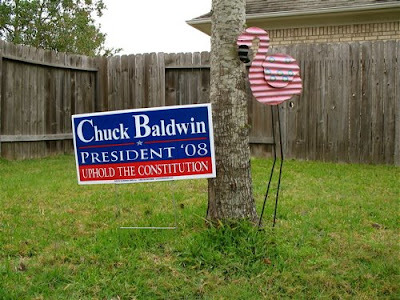 -Our Chuck Baldwin yard sign. It was near a pine tree in the front yard the day before and the day of the election, but now it's in the backyard, just for kicks. Our prayer is that one day, third parties will be much more viable. I believe we need to move far away from a two party system. Third parties have brilliant things to say and do, if only we'd give them a chance. There's my two cents. -We're shopping for an Advent wreath. I think this one will do, but I plan to order beeswax tapers. -Yet another poem by Billy Collins - "Her." He and Kate Daniels are my favorite poets at the moment. I also keep glancing back at an essay that Daniels wrote for IMAGE #36 - "Painting Poems: The Psychological Portraits of Catherine Prescott." Such good writing. -A squirrel shrieking at a neighborhood cat. Squirrels are cute, but man, that scream. Pipe down. Poor cat. -My husband laughing at his own jokes. He does have fun in life. -The first raindrops splattering on a window, and the wind chime whispering of a storm. -Blasting music in the living room while I do housework. Yesterday, it was Red Balloon (again). I get stuck on disc 1, but the whole album is so, so good. -Johnny playing guitar. I've learned a few chords, but he's far surpassed me, now strumming and sounding pretty good. More on this soon. -Amy's black bean chili. For some reason, I'm really into chili as of late. I need good chili recipes, so please share, won't you? I'm waiting on a friend to send me her spicy pumpkin chili recipe. Pumpkin! -Sweet red pepper w/toasted almond soup. This was from a jar, but oh so good. I'm really into soup right now, too. -And licorice spice Tulsi tea. This one is especially amazing. I have a good system going where I do two cups of coffee (or black tea) in the morning, and several cups of caffeine-free tea (or a cup of green tea) during the latter part of a day. -Cinnamon creme brulee coffee (also tastes great, of course) - very autumnal. -Almond + cherry dish soap; this and the pear scent are my favorites. -An All-Nighter candle by the bathtub. -Piñon incense when the air is chilly. -Olbas inhaler and Thieves oil - two health products I cannot live without this time of year. 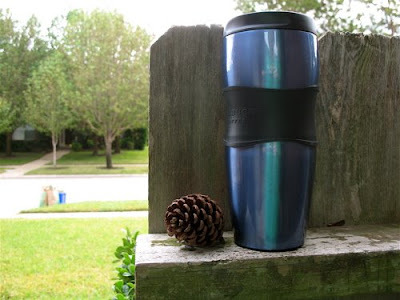 -To-go cup of coffee in hand as we took a morning walk under gray skies. Morning walks really help me psychologically and physically - that nurse was correct. -Tired, but peaceful and hopeful (most of the time), and very thoughtful. I'm reading all types of important things and learning stuff I should've tried to learn a long time ago. God is merciful. -The very odd sensation of using a neti pot, but it's helped my sinuses tremendously. -A hot Epsom salt bath, sweating out toxins; reading a good book. -Grateful. Our preferred candidate did not win, but I'm deeply thankful for the right to vote, and to vote in safety. We are now praying for President-Elect Obama. I want to take a warm salt bath. I completely agree with you about third parties! I wish they had a fighting chance, but now we have plenty of time to ensure that they will in the coming election - I hope. I LOVE Red Balloon. I got to hear her play at the Art Music Justice tour and bought her cd. I'm stuck on side 2. Okay, you MIGHT have a little visitor over sometime soon if those butterflies stick around. Violet LOVES them! I kid ~ about the visiting part. Don't want to just invite ourselves over ;) But Violet DOES love butterflies. Nicole, you'd love the salt baths. See, Jean? Both discs are so, so good.